We carry a large stock of different FEP films. Sheet sizes stated are minimal sizes. Real size can be bigger. Minor damage may exist around the edge (1″ to 1.5″) of a sheet. This damage will should not affect printing since it is outside the printable area on regular 3D Printers. 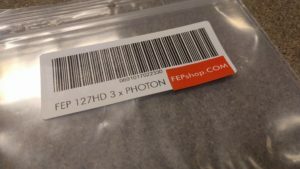 Very small specks can occur in some types of FEP Film. These specks should not affect usability of the sheet. Our sheets do not contain pre-cut mounting holes, at the moment these are only available as a custom item. Contact us for more information about pre-cut FEP Sheets. How you mount your sheet depends on your machine. If you need help you can always contact us. Sheets don’t contain pre-cut mounting holes, at the moment these are only available as a custom item with a minimum order amount. TIP: FEP is very strong, But you can easily puncture it with a sharp needle like object. Once punctured screws or mounting posts will slide through and stay centered. These ziplock bags are shipped in envelopes with a strong cardboard back. When shipping outside the EU and remote locations we use flat cardboard boxes or extra protection with cardboard. Lengths of FEP are shipped in strong cardboard rolls. These roll are packed in boxes. If you have any issues with our FEP just let us know and we will try to help you solve it. If you have any questions about FEP, please do contact us.